I really like Heaven & Earth and Undressed palettes, both have neutral shades. I read that Undressed is dupe for Urban Decay Naked palette. 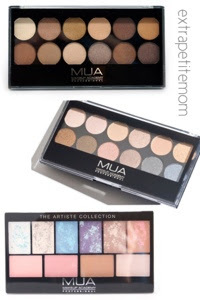 The colour pay off are if not similar is almost identical to the UD Naked palette. I wanted to get UD Naked palette but it's sort of expensive £36/ US$50 while MUA palettes only cost £4 considering I'll be using these just for special occasions and events (not on daily basis). I might as well get something that is cheaper but have almost the same quality and pigmentation with the higher end one. The Artiste Collection is their newest addition, 6 marble-like eyeshadows, 2 blushes, 1 bronzer and 1 highlighter. A great bargain especially for me who have not ventured into wearing bronzer and highlighter yet. Oh right! Their eye primer is in the shopping list too. I was thinking of getting their brow kit but I think the colour is not suitable for us with darker colour brow, so I'm gna pass. 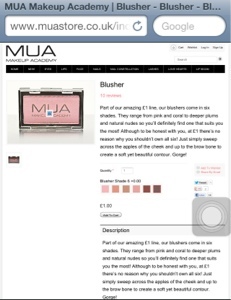 I might be venturing out to cream blushes once I get all my brushes fix. ;) Who knows! glad I converted you into lusting for this brand :p you should try Essence's eyebrow powder kit.